As a stark contrast to yesterday’s forty-year-old video game technology, today’s is one of the newest and most popular video games. And, while the best technologies were in arcade games back then, the advanced graphics technology is now at home on PCs and console games. 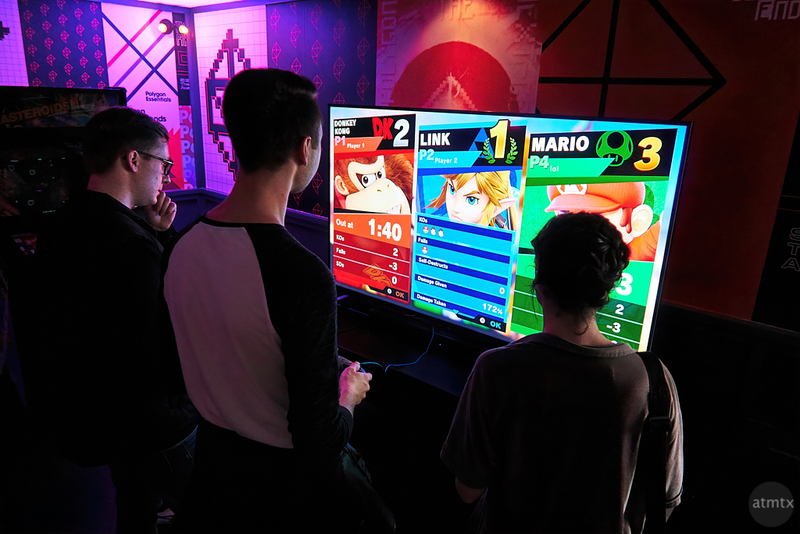 This is Nintendo’s Super Smash Brothers running on the hybrid, portable and TV connected, Switch. For a while now, Nintendo has not produced consoles with the most power. That crown gets passed back and forth between Sony’s Playstation and Microsoft’s Xbox franchises. But what Nintendo lacks in power, they make up for in innovation and fun, playable games. Sony and Microsoft complete on technology instead of artistry. They are equivalent to the full frame cameras of the photo industry. Capable, yes, but do they innovate beyond make things faster and more powerful? In contrast, Olympus and Fujifilm innovate and take the road less travelled, sort of like Nintendo. The Nintendo Swtich is a big hit, as is this game. My sixteen-year-old plays it with his friends in school, as do my co-workers at home, after hours. While it features animated cartoon violence, it’s tame compared the realistic and brutal portrayals on the other platforms. Companies like Nintendo should be applauded for not taking the obvious and simple way forward. That’s what smaller and scrappier companies need to do. I have a monthly newsletter that’s perfect for busy people. Signup for the Newsletter to get the best of my posts, old and new, plus additional content not available anywhere else.